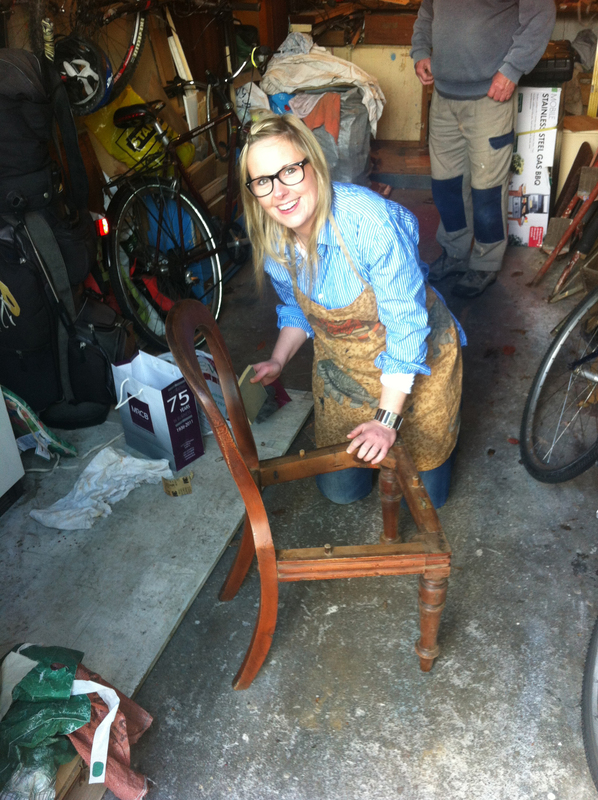 I was approached by the charity Oxfam Ireland who asked if I would be interested in upcycling a piece of furniture/homewares to be sold in Oxfam Home, and then be interviewed and photographed for a feature about upcycling furniture/homewares to appear in Stellar magazine. The Make Space for Oxfam campaign is about encouraging people to clear their homes of unwanted items and is in response to a fall in donations their shops are experiencing. Its a really good idea, and I think what people don’t realise is that this is such an economical way to make your home look great and you really don’t have to be that DIY savvy. 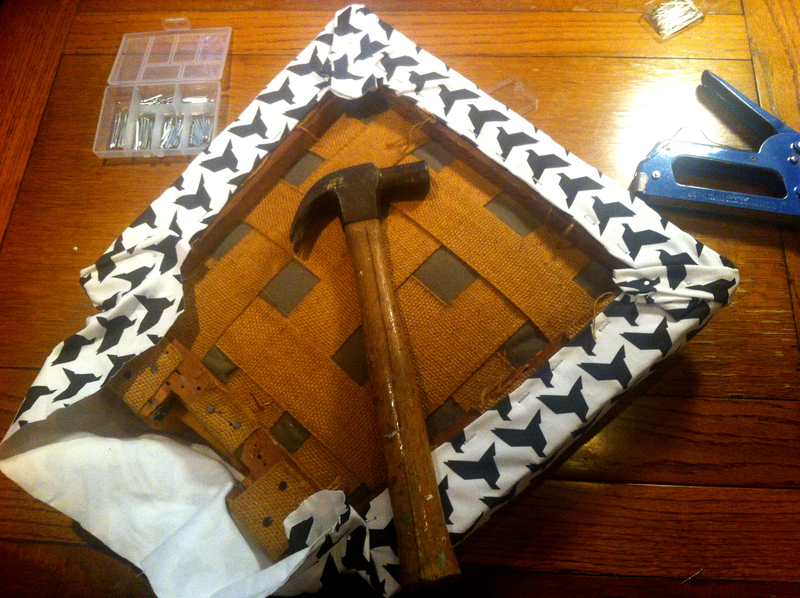 Now I have ALWAYS wanted to reupholster (or should i say recover?) a chair in one my fabrics so I leapt at the opportunity! Even though I have zero DIY knowhow. 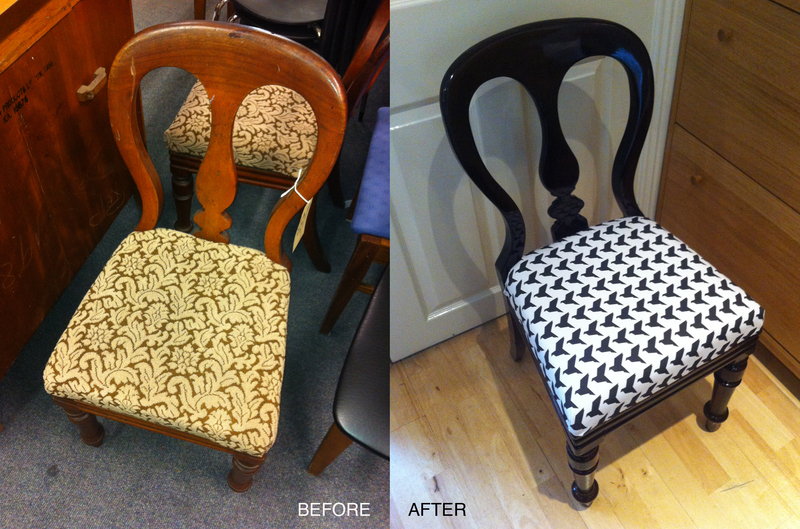 Anyway with the help of my lovely DIY fiance and his DIY Dad, I was able to transform this chair in a couple of weeks. The pics below do not do the chair any justice at all as you can’t see the natural wood coming through, but I will be sure to post the magazine feature with its bright shiny professional pics, and well written blurb about my project, but in the meantime here are a few pics of the transformation. By the way for those who are interested I decided to use one of my first designs, Origami Birds, in a thick upholstery weight fabric to cover the cushion. The chair was cleaned and sanded down and I used a very dark varnish stain to get that dark shiny colour, while still allowing the natural wood texture to come through. Firstly….the before and after shot…. Here’s me DIYing away….just to prove i really did do the work! So the shoot is on thursday and the article will probably be out in next month’s copy of Stellar magazine, but I was too excited about this to wait until then to show everyone. I’ll be sure to post a bright and shiny copy when it’s ready right here! This entry was posted in bespoke design projects, events, fabric design, sewing and crafts and tagged birds, chair, cover, cushion, design, DIY, fabric, furniture, home, homewares, magazine, origami, oxfam, piece of furniture, recover, stellar, upcycle, upholstery, wood texture by seraholland. Bookmark the permalink. Well done, a real modern twist to a classical piece.